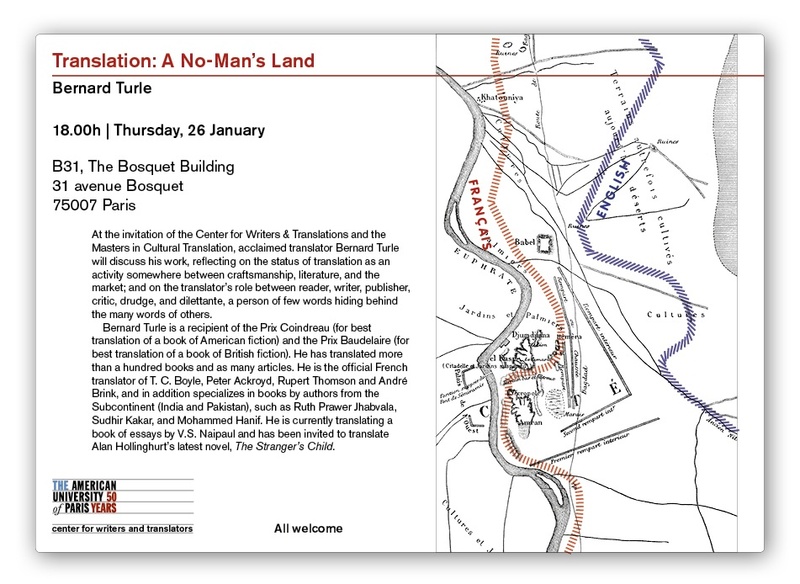 The talk will be held in the Bosquet building, B31; visitors are welcome, and should contact Geoff Gilbert (ggilbert@aup.edu) to be placed on the guest list. Refreshments will be served. Bernard Turle was born in Toulon in 1955. After spending much of his professional life in Paris, he settled back in his family house at the age of forty to become a full-time freelance translator. A former student of the Ecole Normale Supérieure de Saint-Cloud, he was a teacher of English before moving to publishing, helping to start the literary magazine Le Promeneur and the French branch of London-based publisher Thames and Hudson. He started to translate professionally in 1981. He is a recipient of the Prix Coindreau (for best translation of a book of American fiction) and the Prix Baudelaire (for best translation of a book of British fiction). He has translated more than a hundred books and as many articles. He is the official French translator of T.C. Boyle, Peter Ackroyd, Rupert Thomson and André Brink, and in addition specializes in books by authors from the Subcontinent (India and Pakistan), such as V.S. Naipaul, Ruth Prawer Jhabvala, Sudhir Kakar, Siddharth Dhanvant Shanghvi, Manu Joseph, and Mohammed Hanif. A specialist of India, which he sees as “the republic of translation”, he is the author of Bombay Mix Mumbai Max, an account of his thirty years of travels and friendships in India, seen through the lens of the 2008 bombings in Mumbai. He is currently translating a book of essays by V.S. Naipaul and has been invited to translate Alan Hollinghurt’s latest novel, The Stranger’s Child. The Comparative Literature & English Department at the American University of Paris. Welcome to the the official blog of the American University of Paris' Department of Comparative Literature and English.